An examination of the global trade and traffic in discarded electronics that reframes the question of the "right" thing to do with e-waste. The prevailing storyline about the problem of electronic waste frames e-waste as generated by consumers in developed countries and dumped on people and places in developing countries. In Reassembling Rubbish, Josh Lepawsky offers a different view. 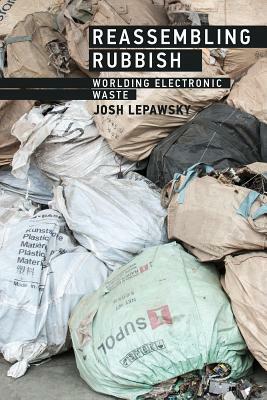 In an innovative analysis of the global trade and traffic in discarded electronics, Lepawsky reframes the question of the "right" thing to do with e-waste, mapping the complex flows of electronic materials. He counters the assumption that e-waste is a post-consumer problem, pointing out that waste occurs at all stages of electronic materials' existence, and calls attention to the under-researched world of reuse and repair. Lepawsky explains that there are conflicting legal distinctions between electronic waste and non-waste, and examines a legal case that illustrates the consequences. He shows that patterns of trade do not support the dominant narrative of e-waste dumping but rather represent the dynamic ecologies of repair, refurbishment, and materials recovery. He asks how we know waste, how we measure it, and how we construe it, and how this affects our efforts to mitigate it. We might not put so much faith in household recycling if we counted the more massive amounts of pre-consumer electronic waste as official e-waste. Lepawsky charts the "minescapes," "productionscapes," and "clickscapes" of electronics, and the uneven "discardscapes" they produce. Finally, he considers both conventional and unconventional e-waste solutions, including decriminalizing export for reuse, repair, and upgrade; enabling ethical trade in electronics reuse, repair, refurbishment, and recycling; implementing extended producer responsibility; and instituting robust forms of public oversight.